Amazon is the third largest digital advertising platform, behind Facebook and Google. The duopoly of Facebook and Google together account for close to 60% of the overall online advertising market in the US. But unlike those two, all ad spend on Amazon is to promote physical products. Facebook and Google provide advertising for all industries. Roughly 38% of the total US digital ad spending is attributed to retail, according to eMarketer. The rest is for automotive, financial services, telecom, travel, entertainment, healthcare, etc. Thus out of the $42 billion spent on Google advertising in the US last year, estimated $16 billion was spent on retail advertising. Similarly, on Facebook, $8.8 billion out of $23 billion was spent on retail. On the other hand, all of $7.4 billion spent on Amazon advertising in the US was retail related. Which all means that Amazon advertising is already a significant player in retail advertising. While only 8.8% of the total advertising budgets were spent on Amazon last year, 18% of retail advertising was spent on Amazon. Amazon’s market share of retail advertising is estimated to grow to 23% in 2019. It will surpass Facebook then. Amazon’s market share growth is the result of it contributing more than half of retail advertising growth in 2019. The 38% figure of the total US digital ad spending attributed to retail includes advertising for brick-and-mortar stores, which Amazon doesn’t compete for, and other retail industries. The exact percentage of overall spend by brands to promote physical products - Amazon’s advertising bread and butter - is smaller than 38%. Amazon’s advertising business is focused on a subset of digital advertising. Facebook and Google are at the top of the marketing and sales funnel, while Amazon is at the bottom. Amazon, thus, has higher conversion rates and better attributable ROI than the competition. Google generated $95.4 billion in ad revenues last year, Amazon topped $10 billion in revenue for the advertising side of its business worldwide. 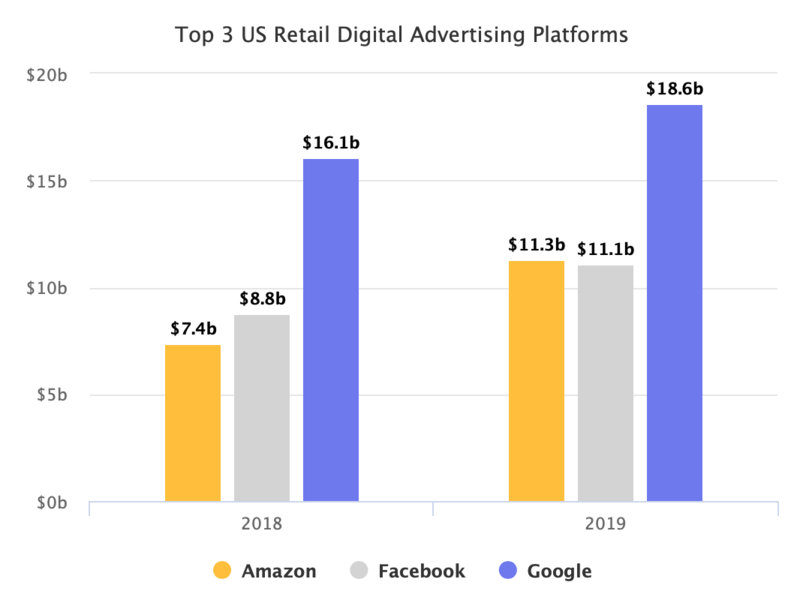 Google is still the giant of advertising; however, when it comes to retail advertising, its total advertising revenue hides the fact that Amazon already commands a significant slice of the market. Google woke up to shopping last year and Facebook is building shopping platforms inside of Facebook and on Instagram through recently launched Checkout service, not because they want to solve shopping, but because brands are moving their advertising budgets to Amazon. Both of these companies need a better story for shopping to offer the same bottom-of-the-funnel gains Amazon’s advertising has.